Last year, I attended the wonderful Game of Thrones exhibit at the TIFF Bell Lightbox in Toronto. It showcased costumes, props and designs from the first season of the show, and offered teaser glimpses of what was to come in the second year. The show was a blistering success, and has prompted a second go. Exactly a year later, the show has returned. Hosted this time at the Design Exchange, the show will run for 10 days, March 9th to 16th, and is free, with tickets available from The Movie Network. 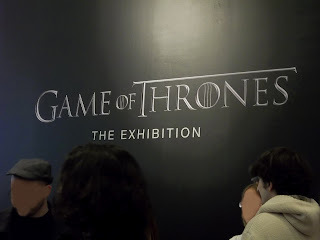 After leaving Toronto, this second wave of the exhibition will eventually travel to New York City, Sao Paulo, Amsterdam and Belfast, giving more of the world a chance to explore the behind the scenes world of Westeros. This new exhibition will be slightly plumper then the last, featuring 70 original "artifacts" from the first two years of the programme, as well as certain teasers from the upcoming year, the Storm of Swords. The exhibit will focus on "key characters," as it did last year, when it put Cersei, Cat, Jon Snow, and Dany on display. Props confirmed for this new show include various pieces of armour and weaponry, such as the Valyrian steel swords Ice and Longclaw. Also returning will be the full sized replica of the Iron Throne, which visitors can have their photos taken on. Please note, it is best to take your own camera and have a mate take your photo for you. The complimentary "photos" HBO provided last year were rubbish. The author would not do well in this position. Things would end poorly for all involved. In other GoT news, HBO has announced eight of the ten episode titles for season three, which leads to some spoilery assumptions, so I've put them after the jump. 1. Valar Dohaeris, written by D.B Weiss and David Benioff and directed by Daniel Minahan. 2. Dark Wings, Dark Words, written by Vanessa Taylor and directed by Daniel Minahan. 3. Walk Of Punishment, written and directed by showrunners D.B Weiss and David Benioff. 4. And Now His Watch Is Ended, written by D.B Weiss and David Benioff and directed by Alex Graves. 5. Kissed By Fire, written by Bryan Cogman and directed by Alex Graves. 6. TBD, written by D.B Weiss and David Benioff and directed by Alik Sakharov. 7. The Bear And The Maiden Fair, written by George R.R. Martin and directed by Michelle Maclaren. 8. TBD, written by D.B Weiss and David Benioff and directed by Michelle Maclaren. 9. The Rains Of Castamere, written by D.B Weiss and David Benioff and directed by David Nutter. 10. Myhsa, written by D.B Weiss and David Benioff and directed by David Nutter. I'll admit to being surprised by the titles. A little put off even. I'm expecting big things from episode 2, as Vanessa Taylor wrote in my mind the best non-Blackwater episode of last season. Martin's episode had previously been announced as Chains, which wasn't helpful at all. But I'm surprised that the events undoubtedly alluded to by the episode title are occurring as late as they are. I figured for Tyrion's biggest role this season would occur more towards the middle, episode 5 or 6. And I have to say, I full heartily disagree with the placement of episode 9. If it is only some pointless adherence that the "big event" has to occur in episode 9, then that is stupid. The idea that each season must end with Dany is equally ridiculous. The Red Wedding (if you don't what it is, don't look it up and spoil it for yourself) should be last. It should be the closing moments of the season, leaving us on that hook for the rest of the year. The biggest weakness of last year's finale was that it took too much wind out of the previous episode. There doesn't need to be epilogues every year, sometimes the narrative just needs to simmer. Tyrion shouldn't have appeared after his attack during the battle, in order to increase dramatic tension, if not within the show, then within the viewer. It's not like they don't know they'll be getting a fourth season pick up. I expect it to be announced half way through the first episode. Via Den of Geek, Canada.com, and the Movie Network.